Last year, Summer Bird ridden by jockey Kent Desormeaux, took the top prize at Belmont Park. The third leg of the Triple Crown is taking place in New York on this weekend and we couldn't think of a better reason to get out of the house. 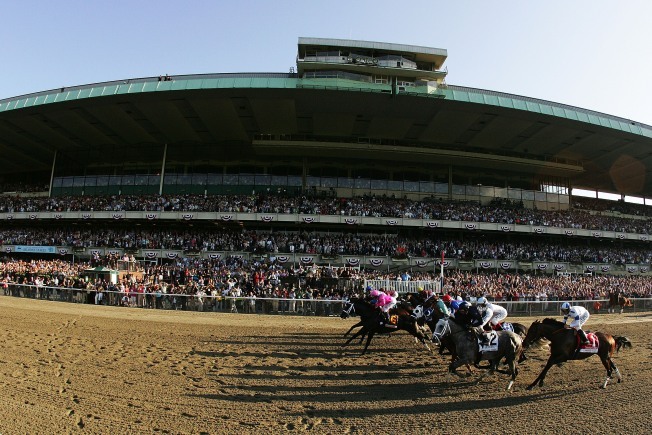 More than 30,000 fans will gather in Belmont Park this Saturday for the 142nd running of the Belmont Stakes, and at 6:30 p.m. jockeys will shuffle into the gate with their horses and await the starting cue. To catch the action in person, tickets are still available at Ticketmaster.com for $20 and up. But, if you’re not up for the crowds, heat and humidity -- not to mention the trek to Queens -- you can part take part in the suspense and excitement from the comfort of one of Manhattan’s watering holes. Free Hotdogs or Chicken Wings from noon to 8 p.m. The race will be played on 14 HD TV screens throughout the restaurant and a giant screen. The bar will also have a raffle where customers pick a number and if the horse with that number wins, the customer gets a $15, $20 or $25 gift certificate to the restaurant. Thirteen flat screens will play the race. If you’re not up for getting out of the house, make your own Belmont Breeze at home and check out New York City’s Off-track Betting Web site. Shake the first six ingredients with ice, and then add in 7-Up and club soda. Use a sprig of mint and lemon wedge for garnishes.